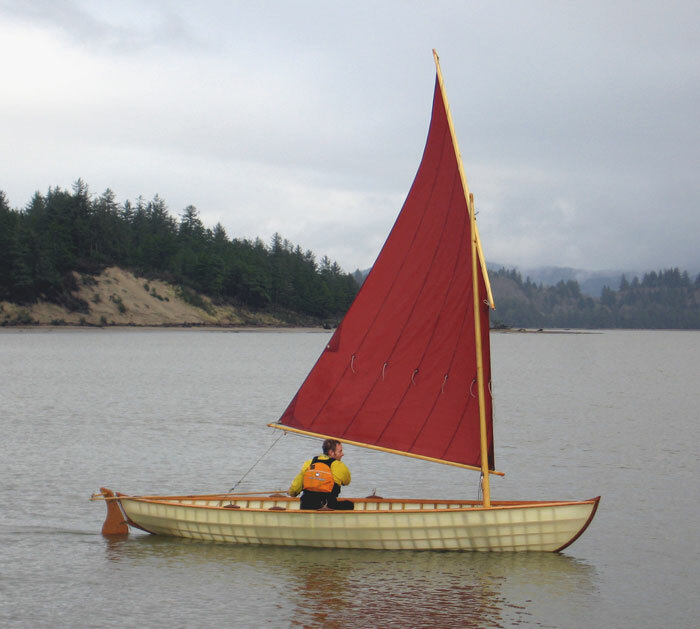 I was looking for a double ended rowing / sailing beach cruiser that two people could use for extended camping in semi protected waters. 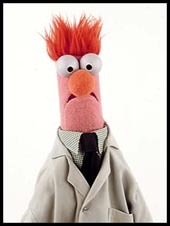 Ben Fuller brought this design to my attention. 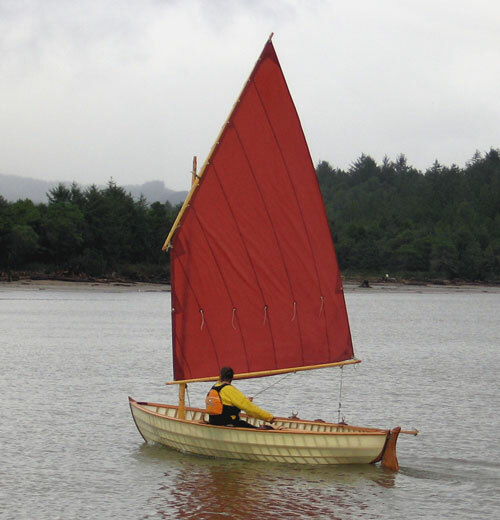 The boat is similar to a Swampscott dory but carries a bit more waterline, a rockered keel, a fuller hull section, and an external skeg. 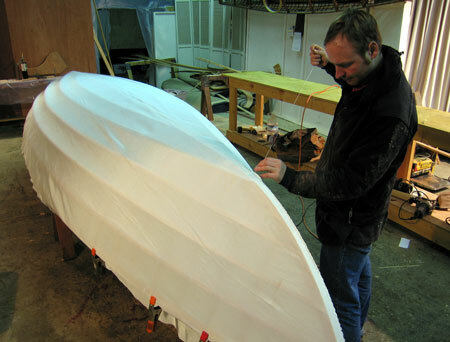 The boat features a kickup rudder, daggerboard, and an 86sq ft lug sail. 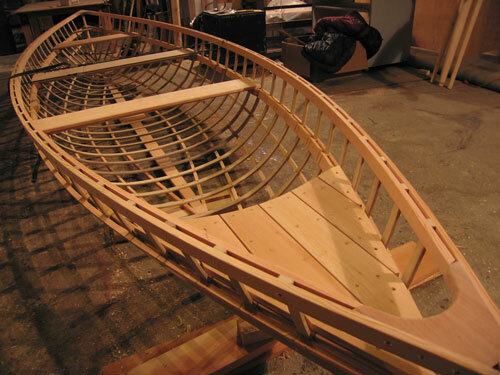 I can't wait to get this beauty on the water. 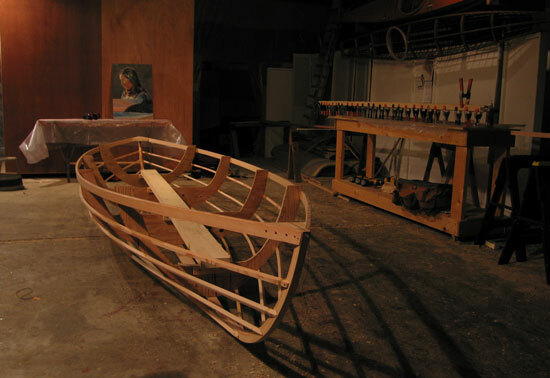 Working from plans I drew up this broad strake plywood design and then rounded the hard chines with a batten, adding a touch more fullness in the bilge. I reduced the freeboard by an inch to compensate. I'll update this page frequently as I build over the next 2 weeks. 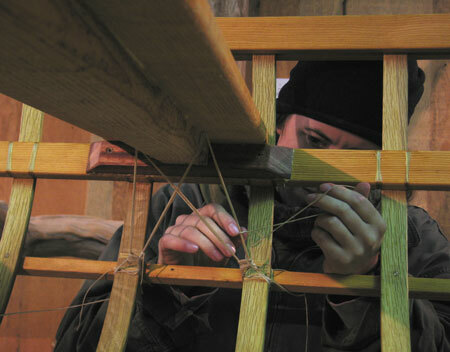 A simple form is built; winding sticks are laid across and sighted to check for twist. 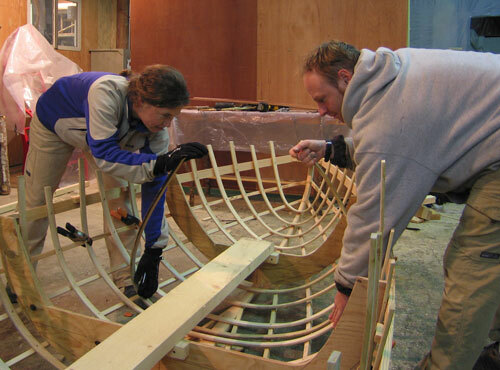 Setting up the gunwales, keel, and laminated stems. The shape is not forced, this is important. 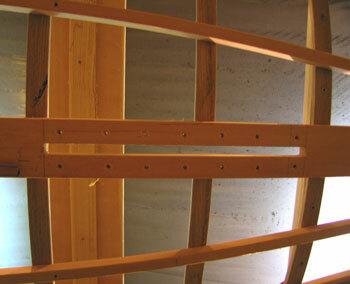 Stringers are layed on, secured with sheetrock screws and faired into the stems. I use a small bronze ringnail and a lashing to fasten the ends. Stringer edges are broken but the overall section is left 3/4" square. The boat ready for ribs at the end of day 3. 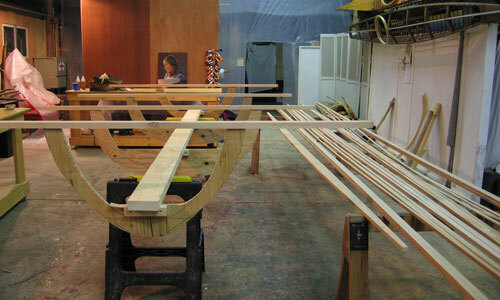 The yard for the sail rig is being laminated in the background. Bending in the ribs, white oak 3/8 x 1 1/8 on 6" centers. 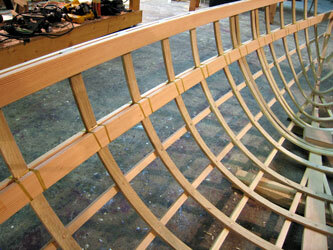 I block back the ribs in the midsection to help keep the boat from wanting to spring open when the form is removed. Day 5, Rebecca Reynolds and myself bending in the last of the ribs. They are fastened to the stringers with a piloted bronze ringnail. Laminating the outer stems from 1/8" mahogany strips. I used 1/4" fir on the inner stems, tough to bend. 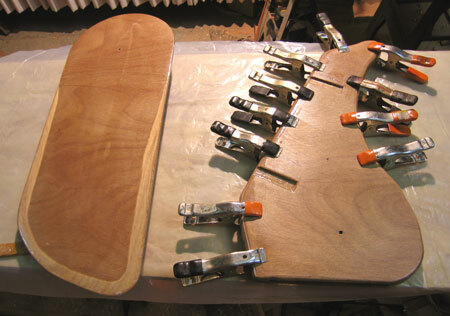 I do all my laminating with urethane glue (gorrila glue); it has proven itself to be strong and waterproof. I avoid epoxy whenever I can. You can see in this picture that the inwale has been added and fastened. 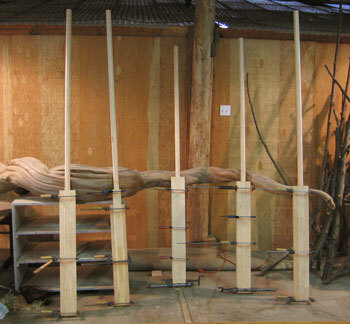 Day 7, Finishing the shaping on the outer stems and shaping the spars out of laminated Sitka Spruce, this is local wood I milled with a friend, it is neither entirely clear nor entirely dry, but should work just fine. I did make one painful mistake, after routing channel up the center of the mast for a running light, I glued the wire inside and then accidentally pulled it too far and lost the other end. All the stress from the thwarts and especially the mast partners is transmitted to the hull via the seat riser. Fastening it to the frame is a serious job. I screwed each rib to the riser from behind, and lashed each intersection tightly, sandwiching the riser, rib, and stringer behind it. The procedure took more than five minutes per rib. Day 9, I built and fastened the riser doublers with glue and screws. Also constructed the rear seat and thwarts, stiffening the 3/4 x 7 1/2" spruce with a smaller piece glued and nailed to the undersides. Everything is fitting very nicely. Aligning the mast step and partners. Accuracy is critical. After the sockets are cut out I decide to reinforce the mast socket with a piece of marine ply, one less thing to hold my breath on during that first accidental jibe. Everything is glued and screwed together. The mast fit we are looking for here is absolutely snug. I accomplished this by cutting a hole 3/16" larger than the mast and then lining the hole with 3/16 leather, leaving the socket 3/16" too tight (because the leather opposite itself is added). Working the mast with a sander the desired fit is achieved. Day 11, Christmas day. 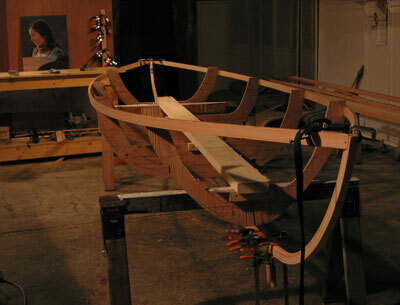 Making the daggerboard and trunk (trunk plug in the background). 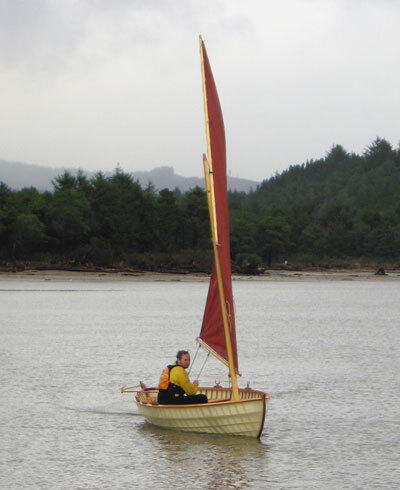 The set up is the same as for any small boat. 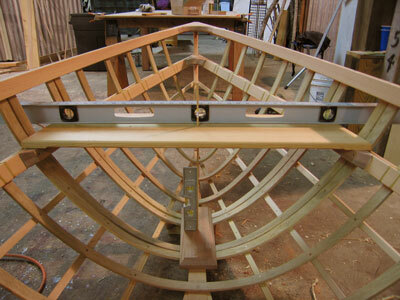 Looking up at the slot for the daggerboard and the tips of the end logs. Like the mast set up, precision is important. My background in finish carpentry is helpful here. 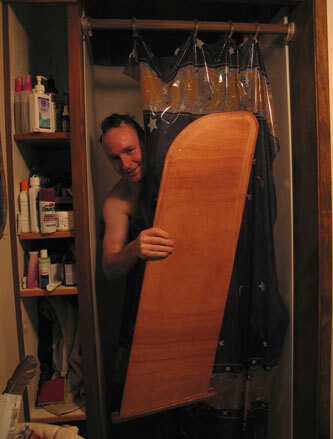 The daggerboard trunk is bedded in thickened epoxy (couldn't find my 5200) and screwed down from beneath. This is a great way to get an eyeful of epoxy so I wear a face shield. 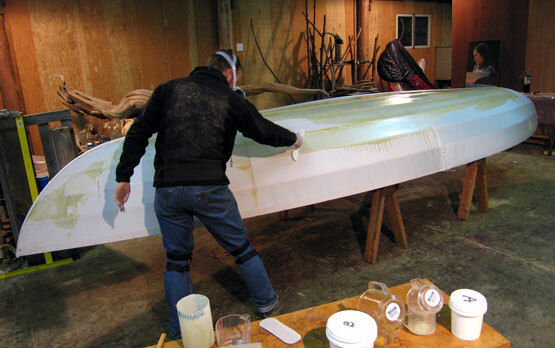 Making the kick-up rudder. 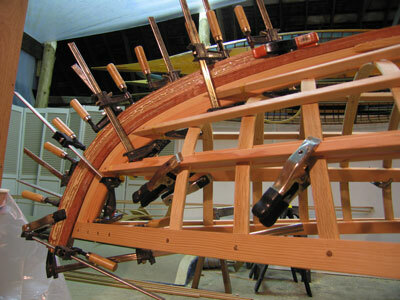 The recessed slots accept the rudder hardware. 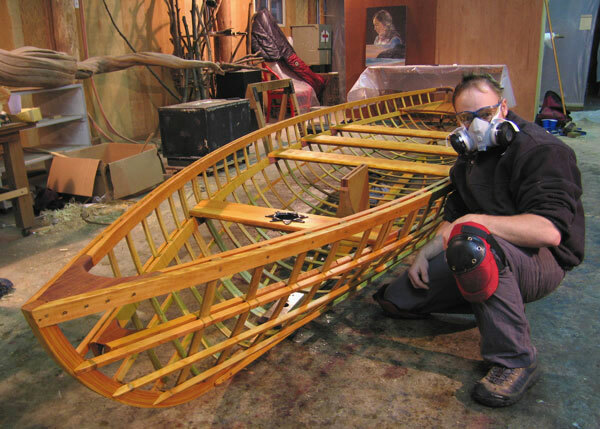 Day 13, me and the freshly oiled frame. I used Penofin marine finish, and fresh organic vapor cartriges on my respirator. 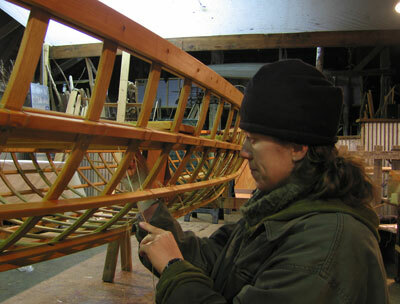 Ginny tying important diagonal lashings to stiffen the framework near the thwarts, which are also screwed down. Day 15, the 12 oz nylon fabric is draped over and pulled tight, the ends are cut, seared, and stitched. The sides are stapled and the excess is cut off. A rub rail hides the staples later. Spreading on the goop, this is a 2 part polyurethane available from Corey Freedman (360 299 0804). I used about a gallon, or $200 worth. This stuff is bulletproof but can be tricky to work with. The application is wet on wet, 3 successive coats. 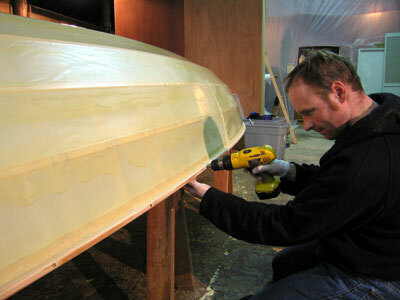 Attaching the rub rail while the coating is still wet. 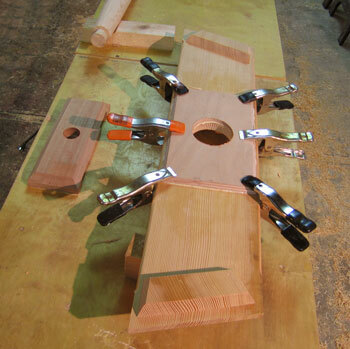 Attaching the laminated mahogany outer stems and the oak bottom plate. 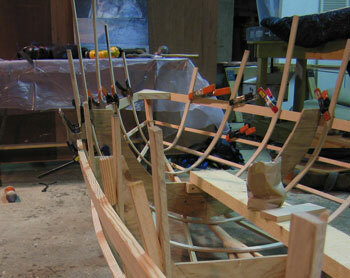 Day 17, The boat is done with lots of little jobs remaining. 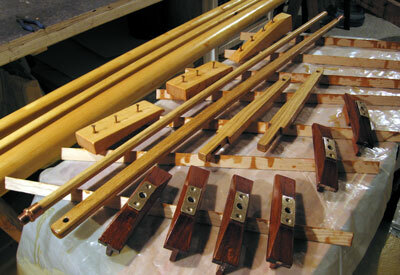 Varnishing, adding the brass half oval to the stems, making the oarpads, making the push pull tiller. 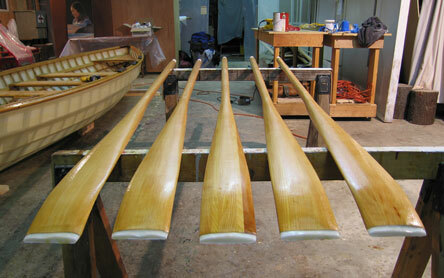 Glueing up the oar blanks, I'm using the best Sitka spruce in my shop for these. Varnishing all the little parts. 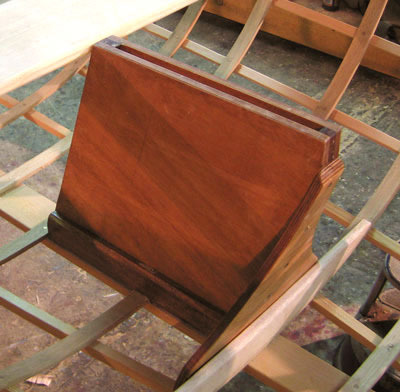 The oarpads in the foreground key into the gunwales and are set with screws and glue. Day 18, DISASTER! Due to an unforseen chemistry problem with my epoxy and varnish I am now left with a horrible uncured sticky mess on every epoxied part. Today was spent scrubbing the pieces clean with paint thinner. What a mess, and a 2 day setback. 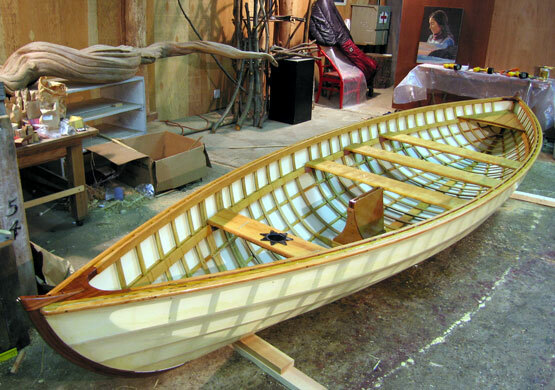 Day 20, varnishing the oars and everything else. I ordered the plan for these highly efficient spoon oars from Walt Simmons of Duck Trap woodworking, good site, with lots of info and hard to find products. I'll be finishing the epoxy tips later as it cures. 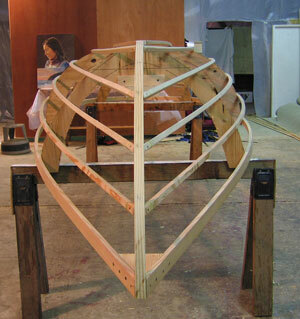 After installing the oarpads today the boat is mostly done. Day 23, after completeing the dozens of little jobs we finally get to the water, The maiden sail / row was a lonely affair under dark skies, with just two friends and the gulls. Kathleen went out with me on the first sail, and then I headed out alone. With no weight in the boat she easily ghosts along at hull speed. 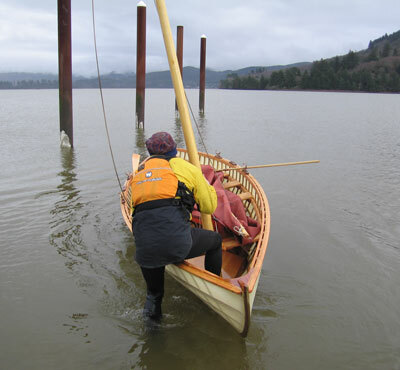 Even when hiked out in the gusts I noticed no twisting in the hull which was my greatest fear in adapting the boat to Skin on Frame. 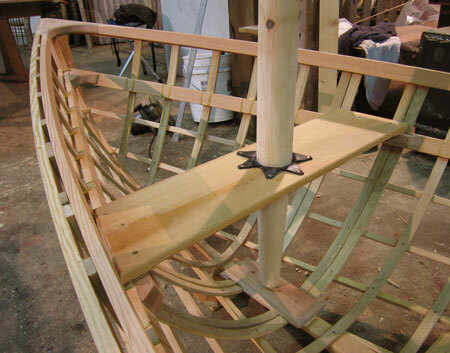 The spruce spars do a magical job of absorbing the shock to the frame. It doesn't track well under oars which according to the prototype owner is the case in his also. I'll have plenty of time to learn to row straight in the Sea of Cortez. A very sincere thanks to Ben Fuller, John Silverio, Steve White, Walt Simmons, and Grant Gambell for helping me to make this idea a reality. LOVE the sail Grant.